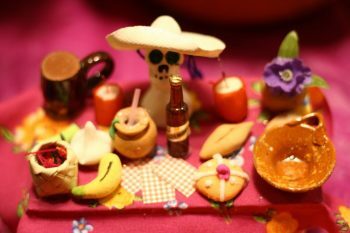 Next week, Mexicans all over the world will celebrate el día de los muertos or day of the dead with ofrendas (offerings), pan de muerto (day of the dead bread), and photographs of their loved ones. While the celebration has always been strong in Mexico, it has recently become much more commercial. But how did this happen? Because of its geographic location, Mexico is heavily influenced by the U.S. From food to clothes to music, American culture quickly seeps through the border. When I was little, no one really celebrated Halloween. Children would set up the ofrendas at school, usually to someone of educational relevance to them; some schools held contests to see who had the most original ofrenda and the winner was announced. Nowadays, schools have begun mixing día de los muertos and Halloween with the same ofrenda contests, but also with costume contests. Costume parties are quite common and stores are filled with the typical Halloween goodies. This mezcla of traditions has certainly made día de los muertos much more commercial with stores making available Frida Kahlo costumes (she is probably the one dead person who gets the most ofrendas), Catrina costumes as well as the typical Halloween paraphernalia. I would have never expected to link James Bond to el dia de los muertos, but here we are. “Spectre”, the 2015 James Bond movie, starts off in the beautiful ciudad de México with James Bond chasing and being chased in true badass style. During this scene, he is walking around a desfile (parade) of the día de los muertos that resembles a procession. When I saw the movie, I was quite impressed with this parade because it looks amazing (thank you Hollywood) and it also didn’t exist. The movie made this parade so popular that ciudad de Mexico began one shortly after the movie attracting tourists from all over. The video below shows part of this opening scene. The Disney movie Coco is yet another way the celebration has been comercializada (commercialized). James Bond’s involvement with the día de los muertos is quite short, but Coco explores the celebration as a whole. El día de los muertos is a day when we believe our loved ones come to visit us. We leave them their favorite food, their favorite copita (literally small glass, but means alcoholic drink), and we reminisce. I personally found the movie to give a very fair portrayal of the celebration. If you have seen the movie, you were probably moved by mamá Coco’s relationship with her father even while he is dead. She is the reason he hasn’t vanished. I expect a lot more families will have ofrendas ready for their loved ones this year. Movie theatres in the country will once again show Coco and stores are bound to be prepared with related goods. I wrote a post about this movie before, so if you want more details, you can check this link. I mentioned Halloween as the first way día de muertos has been commercialized. The growing popularity of Halloween has caused a backlash response of people wanting to regresar or go back to Mexican traditions. This has pushed a good portion of people and institutions to emphasize more el día de muertos with big ofrendas and more information on the traditions of this day (if you want to know more about this, you can check this post Sasha wrote). In Mexico City, for example, the Universidad Nacional Aútonoma de México organizes university ofrendas; these were previously held on the university’s main courtyard known as las islas, but is now held outside the campus. There is so much interest in the ofrendas and the work the students put that it has become almost impossible to see them because of the huge crowds it attracts. While there is no financial gain in this project, it takes the ofrenda tradition away from its private sphere. Below is a video of last year’s ofrendas. Commercialization isn’t necessarily a bad thing for día de los muertos. While the mix with Halloween with might not keep the tradition intact, there is certainly a lot of common ground. Furthermore, commercialization in the way James Bond and Coco did it has helped reach out to younger generations both within Mexico and outside of it. What do you think of día de muertos? Have you seen this celebration in your part of the world?